The role of transportation in any society cannot be underestimated, more so in the developing world where it plays a critical role in human upliftment. The subject is cross-disciplinary and involves a complex interplay of various forces: land use, urbanization, demographic shifts, population growth, economic factors and ecology. Undertaking a study of this subject is a challenging task and Dr. N.S. Srinivasan has ably shouldered this responsibility over his lifetime of research and consulting. ?Taking the High Road? is a summary of his work over a period of nearly 60 years of service. A work of this nature could have been restricted to sketching the broad outlines of the field without diving into the nitty-gritty of research specifics, but the author has chosen an alternative mode. He presents us with a terse and concise view of hundreds of individual studies conducted over the course of his career. This approach, while appearing to lack the advantage of narrative, nevertheless provides a richness of content. We are offered an insight into the various problems and solutions of this fascinating field, replete with facts, figures and methodological details. The first thing that strikes in this work is the formidable scholarship that has gone into each of the cases presented. In this regard the author?s credentials are impeccable. Dr. Srinivasan started his career in the early sixties. After two brief teaching assignments in Jodhpur and IIT Bombay, he went on to serve at the Central Road Institute, New Delhi and thereafter at the National Transportation Planning and Research Centre, Thiruvananthapuram, where he was Executive Director till 1988. He also worked as an advisor with the United Nations and the World Bank while also serving as visiting faculty at Guindy Engineering College. After retirement he started the Transport Advisory Forum that continues to provide guidance and technical assistance to various government and non-government organizations. He has won several awards and accolades including ?The man who brought order to Delhi?s roads?, ?A pioneer in traffic planning? and ?The father of traffic engineering in India?. The opening chapters of the book deal with the transport scenario in India, where the impact of transport ? road, rail and waterway ? on development, are assessed. 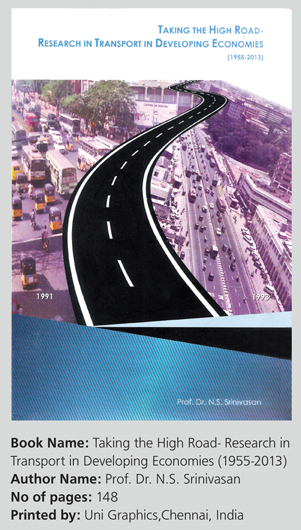 The author, in the following chapter, makes the critical link between urban planning and transportation, with an interesting case study on transportation planning for Delhi. He then proceeds with the subject of mass transportation ? both bus and rapid transit systems. The next section deals with traffic engineering and planning. Several studies are cited that touch upon road geometrics, safety aspects, design of uncontrolled intersections, channelizing islands, pocket lanes, segregation of cycle traffic and monitoring of roads both with and without medians. Some studies were also done on effective deployment of traffic signals, taking into account factors such as standards for signals, standards for equipment, special signals for cyclists, multi-phase signals and signal coordination. Lastly, the needs of pedestrians were also studied with recommendations for better road signs, road markings and pedestrian crossings. A large part of the book is devoted to the crucial subject of road safety. A study of the traffic growth curves showed that as the volume of road traffic increases over the years there is a corresponding rise in the number of road accidents and fatalities. This was estimated to rise by as much as five-fold if no steps were taken to immediately implement a programme for road safety. This would include measures like analyzing the factors contributing to road accidents, identification of accident prone spots, conducting safety audits of road projects, reducing drunk driving, enrolling drivers into training programmes and above all, creating road infrastructure that was ?safe, self-explaining and forgiving?. One of the important objectives of national road planning is rural connectivity. The author notes in a study that ?out of 5.92 lakh villages in the country, only about 26 percent had an all-weather road link and another 16 percent had fair-weather connectivity?. This led to the conclusion that there was an estimated shortfall of 10.74 lakh kilometers of roads that should have been built between 1985 and 2000. What is interesting is that the author does not restrict his prescription merely to the problem of providing roads but takes a more holistic view. He emphasizes that road building must be accompanied by community development and job creation in villages; otherwise it will merely increase migration to urban areas, with all the attendant squalor and exploitation. A number of studies are presented that analyze the economic impact of various traffic management decisions. For example, developing a busy city intersection may entail developing off-street parking lots, pedestrian subways, islands and traffic signals. In view of the heavy capital investment involved, it is essential to conduct a systematic cost-benefit analysis to ensure that the proposed project is economically justified. The author concludes with a study of the energy situation in India and the world. He observes, ?Compared with advanced countries, the energy consumed per tonne kilometer of commodity moved or passenger kilometer is substantially higher in India, where the per capita income is one of the lowest?. A careful study and planned use of energy resources available including basic fuels was undertaken and various options were identified. One such option is the encouragement of mass transportation systems as are prevalent in developed countries like Singapore. Another is to promote the use of railways rather than roads for goods transportation. He also stresses the need to develop the renewable energy sector as a long-term solution for the looming energy crisis. To sum up, this book is essential reading for the serious scholar or enthusiast of transportation research. The wealth of material provided leaves one with the feeling of having grazed the tip of the iceberg in this field. There is no doubt that some readers may be spurred on to read the full research behind this compilation, and in that sense the author has done a great service by putting forth this work before the public. Previous: Is Airport Express metro line in Delhi effective?